Many years ago, when she worked as the executive director of the New York Philharmonic, I had the chance to interview Deborah Borda about women's involvement in professional music organizations. She mentioned that the New York Philharmonic had to "compete for the leisure dollar" in order to survive. The two cents (two leisure cents) I can add to the discussions on various blogs about the future of classical music has to do with the fact that we live in a time when all the arts (performing arts, visual arts, folk arts and crafts, and film) are considered more or less equal as far as cultural value is concerned. To make any kind of hierarchy would probably be seen as un-democratic or even elitist. People who live in cities or in university communities have many places to spend their "leisure dollars." The people who like to be entertained by stuff other than current popular culture can spend their money going to plays, ballets, jazz performances, revival concerts by aging pop musicians from thirty years ago, films, museums, and flashy new "alternative artists." Of course this kind of competition forces the people in the still "fuddy-duddy" profession of classical music-making to market themselves. The people who run classical music organizations have to make Beethoven and Schubert appear flashy and hip in order to seem as "cool" as the competition. Another angle people use is to make classical music seem non-elitist and non-threatening. I don't know if either of these approaches will work for this current generation of adults. Maybe it is because they have been raised with too much diverse culture. We all know that people who really love classical music and people who play and write classical music make up a tiny fraction of the American population (and also the world's population). Maybe this is because most of the people in America under the age of 40 never had adequate exposure to classical music because of unilateral funding cuts for music in the public schools during the late 1970s. I think that the only way we can grow a new audience for classical music is by getting excellent music education back into the public schools and keeping it there. It should be active for those who have talent and interest (ensembles, lessons), and it should develop superior listening skills for those who do not have musical talent or do not want to perform. These are the people we need to fill the very important role of audience: people who express themselves emotionally through listening to other people express themselves musically. If school systems were to hire excellent music teachers (I was very lucky to have excellent public school music teachers from grade school through high school) and pay them very well to teach very well, we might have hope for the next generation. A friend of mine found this 2003 performance by the LeVeck String Quartet on line. Tom no longer plays with us (we have changed our name to the Downstate Strings to represent our location rather than our first violinist), but he is the only person named in the article. The other members of the quartet are Terry Coulton playing second violin, Martha Lhamon playing cello, and me playing viola. I wrote the music that we are playing -- two movements from Five Pieces for String Quartet based on Chassidic Melodies. What a thrill to find this performance on youtube today! Yesterday I taped a runthrough in the hall of the program I am playing tonight in celebration of Mozart's Birthday, and I noticed that once in a while I lapsed into that dangerous practice of playing notes without vibrato in order to get some kind of color change that I thought might have been appropriate. When playing a modern violin with a modern piano in a hall with modern community college acoustics (in other words, a hall that does nothing to help project the sound), vibrato-less notes just don't go anywhere. They fall on the ground like bird droppings. Historically-informed performance practice, which some people apply to Mozart on modern instruments in the form of imposing a scholarly hierarchy on the relative importance of a series of notes, and using vibrato only as an ornament, isn't working for me, on this day, and for this program. So my presents to you on your 251st birthdy, Herr Mozart, are readings of your Andante and Fugue, your Variations on a French Song, and your F major Sonata with lots of vibrato. 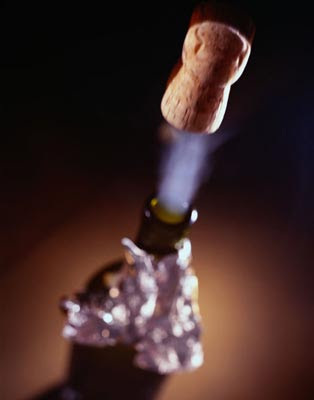 It adds spice to the stew and bubbles to the champagne. Anyone visiting this blog should go straight to Matthew Guerrieri's "We can't all, and some of us don't" at Soho the Dog to read his refreshing take on the future of classical music as we know it. After reading (or shall we say devouring) Daniel Levitin's This is Your Brain on Music, I explored his website. Tucked in a corner is a wealth of very funny cartoons made by Levitin and his friend Dan Piraro. Here's a wonderful opportunity to see as well as hear Ilya Kaler play the Sibelius Concerto. Sure, he was quite young at the time, and he has continued to grow as a musician since winning the Sibelius and Paganini competitions, as well as this 1985 Tchaikovsky Competition. While I'm practicing, I find myself thinking about how his left hand looks. I thought it would be a nice image to share. Pauline Oliveros' words of wisdom came from a collection of statements from composers on Steve Layton's website. While wandering through websites and blogs on the internet, I can't help noticing that blogs that discuss new music seem to be written mostly by men, and inspirational words of advice from composers and musicians are also mainly quotes from men (as shown on Steve Layton's inspirational choices). Why, in an age that claims to be "post gender," is this still so? Are we beginning to move backwards? I do agree that what I guess could be called "retrospective gender equality" in music is often misleading, and sometimes even silly. The music history textbook I use for my music appreciation course (I didn't pick it) gives Hildegard's "Oh Greenest Branch" as its sole example of Gregorian Chant. Of course it isn't a piece of Gregorian Chant, but it is written by a woman. The textbook's sole example of Troubadour music is by Beatrice, the Countess of Dia. Go figure. It is a fine piece, but the Countess was not your typical Troubadour composer. The textbook publisher wanted to give the impression that women who wrote music in the Middle Ages were just as important as men, but he (I'm assuming the publisher is a company run by a man or a group of men) gives a false impression to students who know very little about both music and history. The textbook goes on to discuss a piece by Barbara Strozzi, and even provides a detailed listening guide for it, but the publisher neglected to include the piece on the recordings that come with the book. I guess the project was a clumsy stab in the dark at trying to make a statement that women have been writing for as long as men have been writing music, and whatever proofreading powers that let the book out into the world drew a bit of a blank when it came to the Strozzi piece. I began thinking seriously about myself as a composer about ten years ago. The late 1990s was a time of forward feminist thinking that translated itself musically into the re-discovery of many 19th century women who wrote music. Some of the "high profile" composers were excellent like Fanny Hensel, Clara Schumann, and Louise Farrenc, and some where not so great, like Alma Mahler. Because of the dedication of recording companies and musicologists, I have been able to draw a great deal of inspiration from hearing the works of Germaine Tailleferre, Lili Boulanger, Amy Beach, and Ruth Crawford Seeger, who still, in spite of their staying power, carry with them the title of "woman composers." In a day when "woman driver," "woman banker," "woman writer," and "woman doctor" would be considered rather silly to use in polite and educated company, I fear the the title "woman composer" is still with us. I have actually never considered myself one, and one of my goals in life is to be able to write good music without having to be put in the sub-category of "woman composer." And oh how I wish I could find more women who write music and think about music critically willing to talk about it on the composer's forums on line. I came across David Levenson's obituary in the Boston Globe today. He was my theory and counterpoint teacher at Newton South High School. Two of the people quoted in the obituary, William Wright (who I knew as Billy), and Frank Powdermaker, were both in my theory and counterpoint classes. I believe that there were six of us in the counterpoint class back in the 1975-1976 school year, and, mostly due to the no-nonsense teaching of David Levenson, four of us went on to become professional musicians. For some odd reason I started thinking about Rohan Joseph, a man I knew in New York during the late 1970s. I met him through a friend who introduced me to him as an idealist who would probably be willing to take part in helping him form an orchestra in New York that would provide an alternative to the New York Philharmonic. Gee. I was as interested as the next flutist in having some kind of orchestral employment and not having to leave New York. Rohan's plan was to get people who enjoyed playing chamber music to play together on Sunday afternoons at his apartment. His idea was that this core group of people would form the core of the orchestra. What musician doesn't like the idea of playing chamber music with the promise of eventual employment? Rohan got me to get my friends at Juilliard to come and play. Sometimes I would play stuff with him. He was a rather weak pianist, but he assured me that he was a brilliant conductor. I was impressed by the way he could play chess with many people at once and win every game, so I gave him the benefit of the doubt. He had already assembled a board of directors for what he called the American Philharmonic Orchestra. The "celebrity" on the board was Xavier Hermes, though during my two-year association almost daily with Rohan I never actually managed to meet him. The only board member I actually met was an airline pilot who was very generous with money but knew very little about music. Rohan had a roster of principal winds, and I was going to be the principal flutist. There was some talk (from Rohan) about David Nadien playing a concerto with the orchestra, which got everyone excited and got several principal string players from major orchestras (whom I knew and encouraged to consider working with Rohan) interested in possibly playing concertos themselves. As the orchestra roster continued to grow, so did Rohan's dreams. He imagined that the orchestra might have its own building where people could live. He imagined playing concerts at Avery Fisher Hall in Lincoln Center. He also imagined that if he could get Juilliard students interested, he could enlist some more powerful and connected players from the freelance world. He did, and eventually he ended up holding auditions for every position. He hired powerful people in the freelance world to listen to the auditions, and I was no longer guaranteed the position of principal flute in the orchestra because I had to audition as well. My audition went well, but I was given the position of second flute. The first season had only single flute music (a Bruckner Symphony and Schubert's 5th). I was rather heartbroken, but I tried to understand and make the best of the situation. For some reason the principal flutist could not make the first rehearsal, and Rohan asked me if I would play. I wasn't happy about it, but my loyalty as a friend made it impossible for me to refuse. I had a real shock at the first rehearsal. Rohan was probably the worst conductor I had ever seen in my life. He had no sense of rhythm, no beat, and he didn't really seem to know the score. Everything became clear to me, and I resigned. I left the country a few months later, and when I returned to New York in 1982 there were American Philharmonic posters all over Lincoln Center. There was also a spread about the orchestra in the Sunday New York Times. I just found out this evening that Rohan died in 2003. It seems that he returned to Sri Lanka, where the music reviewers loved him. Here is an obituary for him. Here is another. Here is a review from the New York Times archives from 1982 of one of his concerts. What a strange musical world we live in. I just came across this glimpse of what television used to be like: Fred Astaire singing with Oscar Levant on Levant's own television show (where he could do and say whatever he wanted to do and say). It looks as if someone used a film camera to film the television show back in the day, the sound is often distorted, but it is really wonderful to watch and listen to this really rare gem. On Jan. 16, 1953, as a violent rainstorm pelted Los Angeles, Sascha Jacobsen, concertmaster of the Los Angeles Philharmonic Orchestra, was driving along the coastal highway to Pacific Palisades, the Red Diamond in its case beside him. His car stalled near Santa Monica and water from an overflowing stream began to surround the vehicle and fill it up. Seeking to escape the flood, Jacobsen grasped his violin case, stepped from the car into the rising waters and struggled through the torrent to higher ground. The Red Diamond was swept from his arms and out to sea as he barely made his way to safety. He watched, helpless, as the violin case floated away. The next day, a prominent Los Angeles attorney, Frederick H. Sturdy, was walking along the beach of the Bel Air country club and spotted a violin case stuck in the sand. Inside the case he found slime, sand, water--and the pieces of a violin. By amazing coincidence, Sturdy was a friend of Alfred Wallenstein, music director of the Philharmonic. When he learned the following day of Jacobsen's disaster and the loss of the Red Diamond, Sturdy immediately contacted Wallenstein. Identified as the lost Strad, the salt water-logged and sand-encrusted violin parts were entrusted to Hans Weisshaar, an outstanding luthier. Over the next nine months, Weisshaar painstakingly restored the violin, returning it to its former glory...both in tone and appearance, Jacobsen later wrote in appreciation. He told friends the Red Diamond sounded better than ever. In 1971, a few years after Jacobsen's death, the Red Diamond was sold at auction by Sotheby's in London for $67,600--far more than it was insured for at the time of its ocean ordeal. The violin was put on the auction block by Sotheby's again in 1985, with an asking price of more than $1 million, but was not sold at that time. A few years later, an anonymous collector purchased it privately for an undisclosed sum--surely paying as much for the magic of its reincarnation as for its other exemplary attributes. It feels great to finish a piece of music! It is satisfying to know that all the notes are in their proper places, but it is also a relief because I won't have to have this piece for oboe and strings, as much as I like it, running through my head all the time (especially when I'm trying to sleep). I'm hoping that the magic of the US postal system will allow it to leave my head; that tomorrow's mail carrier will have magical powers to give me a bit of silence before I start thinking about my next piece. I would have put a picture on this post, but my family and I finished the whole batch at dinner (with vegan chili, of course). It is a little bit on the sweet side, but the sweetness is perfect with the heat of black bean chili made with chipotle peppers. Add the wet ingredients to the dry ingredients, and bake in a greased baking dish for 25-30 minutes. One of the ways that Dounis suggests improving staccato playing is through practicing this bowing exercise using the Kreutzer Etude #2. I think that it is one of the most difficult mental discipline exercises I have ever tried. This example shows two of forty-eight different ways of confusing the bow arm with combinations of up-bows and down-bows at the point of the bow, the middle of the bow, and the frog. I have been doing one bowing configuration every day, repeating the bowing pattern for the whole Kretuzer etude, shifts and all. I hope that this kind of practice is building up some kind of coordination between my brain and my bow arm. I showed it to two of my students. One had as difficult a mental time as I had, but after playing a few measures of her Wohlfahrt etude this way, she was able to breeze through it easily with regular separate bows. My other student took to it immediately, and he got a kick out of the mental challenge. I guess that the term "different strokes for different folks" is operative here. 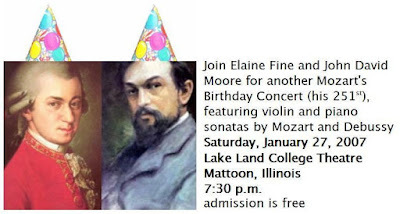 Just in case someone reading this might be in the general neighborhood, here's an invitation to a Mozart's Birthday Concert that I just made. I'm kind of proud of it, which is why I'm posting it here. New Year's Day is always a bit nostalgic for me. 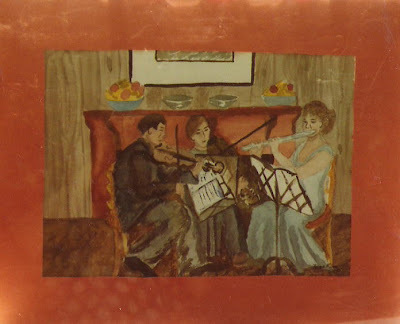 Last night, while I was going through a box of letters and cards from Auld Lang Syne, I came across this photograph of a painting my mother did of my father, my brother, and me playing the Beethoven Serenade. I remember the dress: it must have been around 1978.